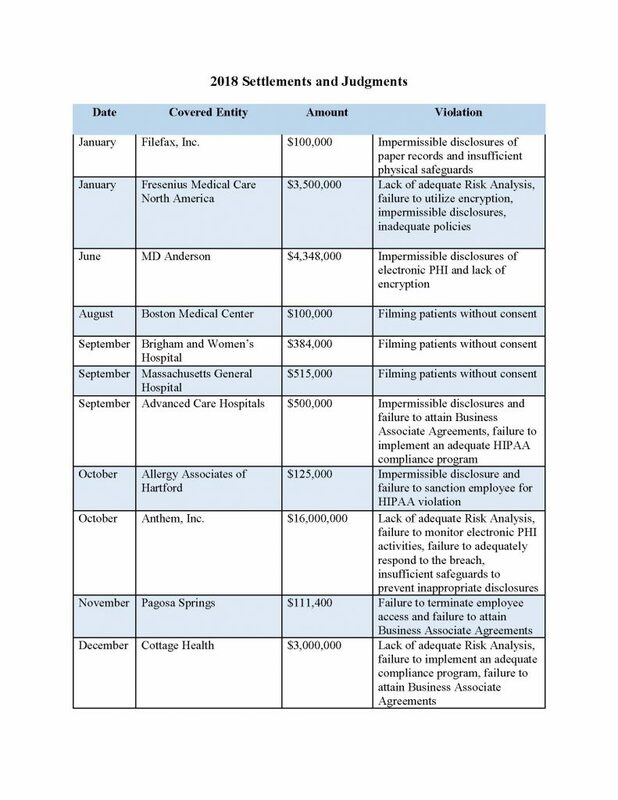 In the current environment of regulation reduction, it is notable that the Department of Health and Human Services (HHS) received a record $28.6 million dollars in publicized settlements and judgments for HIPAA violations in 2018. These numbers surpass previous years with the closest year on record being 2016 in which HHS collected $23.5 million dollars. These numbers reflect that HIPAA enforcement actions are on the rise. Failure to implement encryption solutions or alternative adequate measures. It is important to note that this record-setting total does not encompass all of the enforcement action taken by HHS against covered entities in 2018. These numbers simply represent larger, more notable settlements and judgments. In fact, HHS took corrective action against countless health care providers, health plans and business associates last year and it does not appear that these numbers will decrease in 2019. As of February 22, 2019, HHS has officially begun investigating over 50 entities for large scale breaches. For more information on these investigations of breaches of 500 individuals or more, visit the Wall of Shame on the HHS website. Pursuant to the HITECH Act of 2009, the Secretary of HHS is required to post information about entities who breach the PHI of 500 people or more to demonstrate transparency to health care consumers. Proactive monitoring of electronic systems containing PHI. This uptick in penalties illustrates that HHS is serious about their mandate to protect the privacy and security of PHI. Their record demonstrates that they can be successful at attaining multi-million dollar settlements with health care entities and health plans that don’t comply with HIPAA regulations. This is a good time for health care providers and HIPAA Business Associates to review their compliance programs to ensure that they are meeting the requirements. In HIPAA compliance, the lack of a specific strategy to secure PHI is an actionable failure that could result in a large fine and a loss of goodwill with the entity’s customers, its patients. If you are unsure about whether your HIPAA compliance program is adequate or if you know that it is time to update your policies, procedures and training, consult a health care compliance expert. For health care providers, arguably your most valuable asset is your patient information. Patients assume you will protect their private information. Unfortunately, many practices are not implementing even the basic safeguards required under the Health Insurance Portability and Accountability Act (HIPAA). In fact, Consumer Reports recently warned their subscribers (your patients) they need to protect themselves from improper handling of protected health information (PHI) by hospitals, doctors and insurance companies. HIPAA Compliance should not be a one-time, “set-it-and-forget-it” process. Instead, protecting the privacy and security of patient information should be a culture lived and implemented by the organizational leaders and followed by their employees. Risks are no longer insignificant. Fines range from $10,000 per incident up to $1.5 million per year. The reputation of the practice can be crippled if a data breach occurs and proper protocols aren’t followed. No Updated Policies and Procedures: HIPAA requires documentation to show you understand what is required by law and your practice has the policies and procedures in place. It’s a best practice to purchase a set of policies and review them with your team annually. You can also subscribe to a service like OfficeSafe where policies are online, employees can log in anytime, and updates are automatic. No Risk Assessment on File: You must perform an adequate risk assessment to determine your vulnerabilities. HIPAA does not define “how” an assessment needs to be performed, it only states you need to document your risk level, key vulnerabilities and plans to fix them. Having a risk assessment on file and showing you are making progress implementing key safeguards required under HIPAA will materially mitigate your risks. Lack of Employee Training Documentation: Employees are the first line of defense for your practice. Employees also make human errors. Making training a priority is key to creating a culture of compliance for your practice. Employees can also watch for phishing scams, other employee behaviors, help identify privacy issues and more. Loss of a Device: Losing a laptop or mobile device that stores PHI is a HIPAA violation unless you can prove the data stored was encrypted and/or the device was secure. To mitigate risks, don’t store PHI on these devices and setup controls to wipe data from mobile phones if they are used inside your practice. No Emergency or Incident Response Planning: HIPAA law now requires that every practice document an Emergency and Incident Response Plan. Also, with all of the hurricane’s, fires, ransomware attacks, and other incidents, it makes sense to document your plans in case an emergency does occur. HIPAA requires: 1) a Data Backup Plan, 2) a Data Restoration Plan and 3) an Emergency Mode Operations Plan. A Credit Card Data Breach: Every practice handles patient credit card information. A Payment Card Industry (PCI) violation can also end up being a reportable breach under HIPAA. Securing and properly handling credit card data is imperative. Don’t store any credit card information in QuickBooks, Excel or any other software. Also, make sure you are PCI certified and using EMV devices to limit chargeback liabilities. Violations Under the HIPAA Privacy Rule: Too many health care professionals do not have a clear understanding of The HIPAA Privacy Rule. Not only does PHI need to be secure, but it also needs to be kept private. Practices need to have an updated Notice of Privacy Practices shared with patients and posted in the practice. Also, employees need to understand under what circumstances PHI can and cannot be shared. It’s important (and the law) to designate a HIPAA Privacy and Security Officer for the practice. They can learn the basics and quickly mitigate behaviors that may be leading to unnecessary risks. No Encryption Safeguards: HIPAA does not state you have to use encrypted solutions, but it’s a good idea. Your PHI should be backed up using an encrypted solution. It also should be backed up in the cloud with multiple days of backup sets. Also, when e-mailing PHI, you should be using an e-mail encryption service. Encryption mitigates human e-mail error and also protects the unauthorized access of data. Lack of Compliance Documentation and Execution of Business Associate Agreements: We often see practices struggling to execute their Business Associate Agreements, Employee and Patient Acknowledgments, Authorizations, and overall HIPAA compliance. Compliance isn’t a he-said, she-said proof exercise. You must have updated policies, procedures, and proof you are implementing the proper HIPAA safeguards. OfficeSafe was designed to ease the administrative burdens and uncertainties associated with HIPAA compliance and financially protect you in case of a ransomware attack, HIPAA audit, or patient data breach. What’s the Biggest Threat to Your Medical Practice? Your Staff! Many of us are aware of recent attacks impacting health care entities large and small. As ransomware and other cybersecurity-related crimes are being reported daily, there is a tremendous focus on the “dark web” and how to decrease the likelihood your entity will be impacted by hackers. But as we put systems in place to deal with those security issues, we must not forget about the threat of other malicious actors. These individuals are not strangers who only interact with our computer systems remotely. This threat is much closer. We’re referring to your staff members who may inappropriately access and utilize patient data for personal gain. Employers generally believe they hire the best candidates. In most instances that is correct. After combing over résumés and doing countless interviews, it is determined the selected individual is a person you can trust and respect. As these individuals prove themselves to be competent and dependable, many of us will place a high level of confidence not only in that person’s ability to perform the job, but also in their character. As time passes we learn a lot about our colleagues. We learn about each other’s families, interests and life goals. We become invested in our co-workers, and we share in moments of success and disappointment. These events endear us to one another and become the fabric of our working relationships. However, just as this bonding is reflective of our human desire to find commonalities, these relationships can also blind us to a very serious threat. This threat is the impact that these very individuals can have on our entities if they intentionally or inadvertently compromise a patient’s protected health information (PHI). We must constantly remind ourselves good people can do bad things depending on that individual’s circumstances at the time they make a compromising decision. 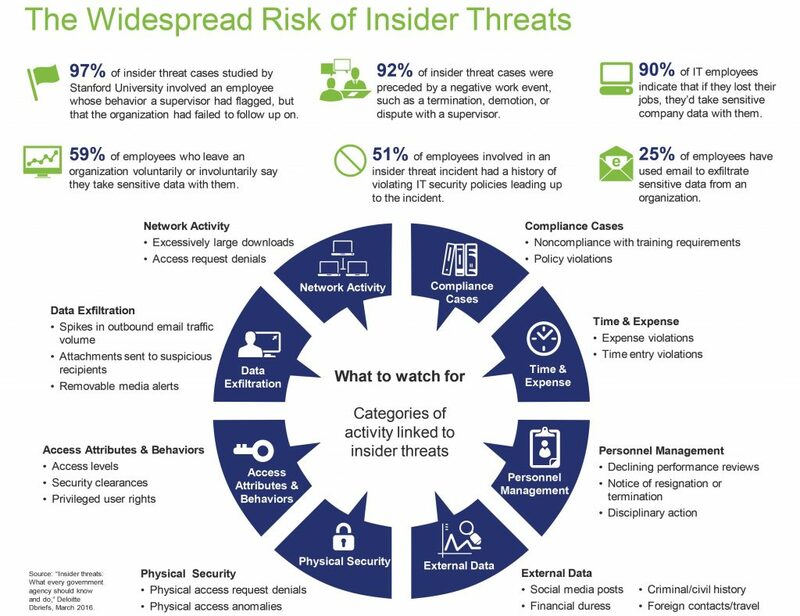 “Insider threat” is a term used to describe the threat to an entity’s systems or data that originates from within the entity. These “insiders” can be current or former employees, contractors, or business associates who have or has had authorized access to an entity’s systems or data and misuse that access. When entities endure a significant data breach, they are often in disbelief the incident occurred. Then as they begin the investigation phase, they realize there were behaviors exhibited by the bad actor that should have drawn suspicion. Works odd hours without authorization; notable enthusiasm for overtime work, weekend work, or unusual schedules which may result in them being able to carry out their illicit activities privately. Interest in matters outside the scope of their duties, particularly where patient data may be stored and how that information may be accessed. Unexplained affluence; buys things they cannot afford on their household income. Without need or authorization, takes proprietary or other material like patient information home, via paper records, thumb drives or by emailing information to their personal email accounts. Overwhelmed by life crisis or career disappointments. Paranoia about being investigated; believes there are listening devices or cameras in their homes or workplaces. Disregarding computer policies on installing personal software or hardware, accessing restricted websites, conducting unauthorized searches, or downloading confidential information. Appropriately manage your employees. Entities should pay particular attention to individuals who are disgruntled or who may be undergoing financial hardship. Also, be watchful of employees who show up to work very early or leave very late with no work product to show for the extra time they’ve worked. Additionally, background checks can be very telling. This is especially true for employees whose records identify financial issues like issuing bad checks. Be mindful of security access privilege designations. Only provide employees with the security access privileges they need to perform their job functions. The less access they have to patient data that does not involve them, the less likely they will be able to create large data breaches. Proactively audit user access. Perform audits of user actions to determine who has been remoting into your entity’s computer network or who has been accessing your systems after normal business hours. Review reports of failed log-in attempts to determine whether employees are trying to log into systems they have not been officially granted access to view. Develop and adhere to effective termination procedures. Once you become aware an employee will need to be terminated, make plans to disable their physical and system access such that the terminated employee does not have the opportunity to negatively impact your entity or systems. During the exit interview, make it clear to the terminated employee your entity will not tolerate inappropriate data access and will seek criminal prosecution if it discovers any employees are engaging in such activity. Effective training programs. Ensure your employees are aware of your entity’s privacy and security policies and procedures. Reiterate these principals in training and inform them of the consequences of not adhering to these requirements. Additionally, train employees to be particularly watchful of co-workers who exhibit the behavioral indicators described above. Ensure they know the warning signs and to whom to report their concerns. and data. The activities of these users should be monitored as well. Individuals within those entities should be signing confidentiality agreements at a minimum and Business Associate Agreements, when applicable. Your entity’s designated Security Officer can play a key role in monitoring the electronic behavior of staff members, Business Associates and contractors. Ensure this individual is knowledgeable about your entity’s HIPAA security policies and procedures, and they are following up on audits that identify behaviors that may be placing your patient data at risk. If your entity does not have updated HIPAA security policies and procedures, consider hiring a health care compliance professional to ensure regulatory compliance. Article contributed by Samarria Dunson, J.D., CHC, CHPC, attorney/principal of Dunson Group, LLC, a health care compliance consulting and law firm in Montgomery, Ala.
2 “Insider Threats: What every government agency should know and do,” Deloitte Dbriefs, March 2016. Do You Record Patient Phone Calls? Here’s What You Need to Know. A physician practice recently inquired about implementing a policy pursuant to which the practice would begin recording phone calls to and from patients and referring providers. The practice of recording phone calls is not uncommon. For example, every time you call a customer service number you are informed that the call “may be recorded for quality purposes.” However, there are some legal issues to consider before implementing a policy pursuant to which you record phone calls with patients. First, from a HIPAA perspective, any entity you contract with to record the calls with patients and to store the recordings will need to sign a Business Associate Agreement, in which such entity agrees to protect the patient information it receives. Failing to obtain a Business Associate Agreement in this instance would be a violation of HIPAA. Second, there is the question of whether you need to inform the patient the call is being recorded. Alabama is considered a “one-party consent” state, meaning you only need the consent of one party in order to record a call — and that one party can be the party making the recording. Thus, as long as the physician practice is aware of the recording, a patient located in Alabama does not have to be informed the call is being recorded. However, things get more tricky when you are making and/or receiving calls from patients located outside of Alabama. Other states (including the neighboring state of Florida) are “two-party consent” states, meaning you need the consent of both parties in order to make the recording. If a call is made from a physician practice in Alabama, a “one-party consent” state, to a patient located in Florida, a “two-party consent” state, the general legal consensus is that the physician practice must comply with the more stringent “two-party consent” requirements. Thus, under this scenario, a disclosure would need to be made to the patient located in Florida that the call is being recorded. Finally, the issue of malpractice liability should be considered. While a phone recording can be helpful in the event of a negative outcome (to prove what information was provided to the patient), it, just like any other documentation, can also be harmful (to prove what information was not provided to the patient). Thus, physician practices considering recording more than routine scheduling calls need to give some thought as to whether such recordings will be helpful or harmful if an issue were to arise. Practices may also want to reach out to their malpractice carriers to see if they have any opinion or policy regarding recording phone calls with patients. Maybe you’ve been planning for retirement for some time or perhaps you’ve had a bad month and have decided that you’re better suited for life on the lake. In either circumstance, when you get ready to leave your practice and wind down your affairs, don’t forget that you still have responsibilities pursuant to state and federal laws and regulations and those obligations don’t cease just because you won’t be returning to the office. The Health Insurance Portability and Accountability Act (HIPAA) and the Health Information Technology for Economic and Clinical Health Act (HITECH) require providers ensure the confidentiality, integrity and availability of their patient’s protected health information (PHI). Thus, providers are tasked with preventing unauthorized access to PHI, ensuring that their records are not inappropriately altered or destroyed, and assuring that the records are available to the patient or other authorized individuals or entities. Pursuant to Alabama law, “When a physician retires, terminates employment or otherwise leaves a medical practice, he or she is responsible for ensuring that active patients receive reasonable notification and are given the opportunity to arrange for the transfer of their medical records.” The law does not specifically define how much time is considered “reasonable,” thus; the type of practice or scope of services provided should be considered in determining reasonable notice. In all instances, notification should be provided in a manner that allows the patient adequate time to act upon the notification and either obtain a copy of their records or find a new physician. Contact information for the new physician if the patient records are being transferred to another physician without the patient’s consent. (Note: The retiring physician should enter into a Business Associate Agreement (BAA) with the purchasing physician to permit the purchasing physician to obtain and maintain the aforementioned patient records. By virtue of that agreement, the purchasing physician is acting as a custodian of records and is required to ensure the confidentiality, integrity and availability of those patient records regardless of whether the patient decides to utilize the purchasing physician for their treatment services. Pursuant to HIPAA, the purchasing physician cannot utilize those patient records unless and until the patient consents.) Alternatively, if the records are not being transferred to another physician, the notice should inform the patient of where the records will be located after closure, how long they will be retained, and contact information to make record requests. Tip #1: While not required, it is suggested that patient notification be sent via certified mail, return receipt requested to the patient’s last known address. This allows the retiring physician to place those receipts in the patient files to demonstrate the attempt to notify the patient of the retirement or closure. Tip #2: Don’t forget about the patient’s right to confidential or alternative communications when performing the mail-out. If your practice has agreed to a reasonable request of a patient to receive communications by alternative means, you must ensure that you have considered that request. For example, if they have requested that you use a particular P.O. box, instead of their home address. At the top of your list for entities to notify should include your medical malpractice carrier. Your medical malpractice carrier can give you a tremendous amount of guidance and many offer a checklist that you can use to ensure that you are covering all of the steps that will keep you eligible for coverage at the time of closure and beyond. Be sure to ask them about any extended malpractice coverage that can be considered for any allegations of medical malpractice that may arise after closure. When a practice is sold to another physician, the aforementioned BAA between the retiring physician and the purchasing physician may be utilized for the appropriate maintenance and availability of records. But when a practice closes, it is often necessary for the retiring physician to contract with an outside entity to maintain the records and ensure their future availability in accordance with HIPAA and state laws. Finding the right record management company is essential in this circumstance, in addition to entering into the required BAA. Whether you enter into a BAA with a purchasing physician or record management company, ensure that the agreement includes provisions relating to record retention and disposal applicable to the types of records your practice utilizes. For example, there are special rules for mental health, substance abuse, and notifiable disease records. As the BAA is being drafted, attorneys and compliance experts should be consulted to ensure that appropriate provisions are included. Whether you are currently facing the prospect of retirement or whether it is still on the horizon, it’s never too early to speak with a health care compliance professional about the appropriate steps to take to ensure compliance with state and federal laws.